My April Fools history is not a good one. I lost my virginity on April Fools, really, true story. Yeah, what a joke that was. And, in one of the worst moments in my professional history, I was put on a warning on April Fools, for having returned to work after drinking a beer 5 hours before, that my boss paid for! Yup, it happened, no joke! 1. Follow the first FOUR Twitter Twaffic hosts listed on the linky. Netiquette and courtesy! They'll reciprocate your love on twitter! 2. MAKE A BLOG POST LIKE I am doing. Copy and Paste these directions INTO IT. 3. 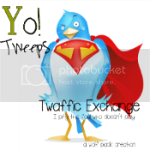 Grab the YO Tweeps Twaffic Exchange Button pictured below from Supah's place. Put him in your post. 6. Now link up the post that you just wrote to the linky! 10. You have to have a BLOG POST to do this. I've been fooled by my 6 year old....twice....all before school. It's going to be a loooong day. I love the car moving thing.. omg. I can't believe you were put on warning after something your boss knew about. Not very nice. I do love the tin foil thing though. We did that once to someone where I used to work. It was hysterical. Until they got us back. (Still funny though). Too funny! I hate April Fool's jokes.